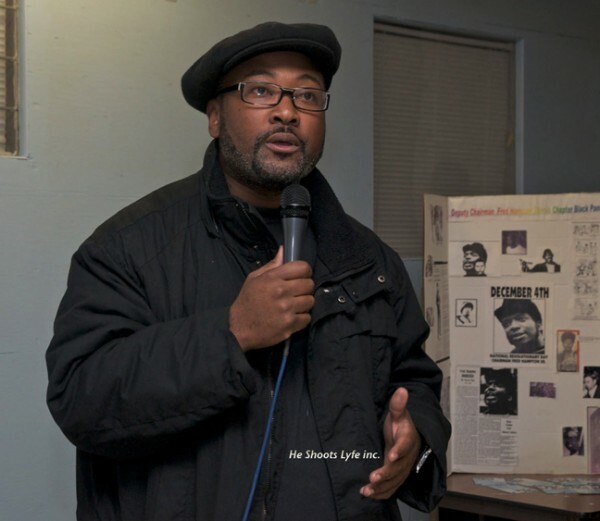 On Monday, January 21, 2013, at approximately 4:30 p.m.,Chairman Fred Hampton Jr., son of slain deputy chairman Fred Hampton Sr. of the Illinois Black Panther Party, as well as three additional passengers, fell victim to the abuse and harassment many Black and Brown Oaklanders experience on a regular basis. The passengers, were aggressively told by the police to not look backward; not to look directly at them, but step out of the car with hands in the air. The passengers exited at gunpoint, one by one. Two women were placed in separate police vehicles, while Hampton and the other male passenger were told to remain standing outside in handcuffs. A female passenger and mother of three small children was handled so roughly by officers that she had to be taken to Alta Bates Summit Medical Center (after being detained by police for over 3 hours) for treatment of a severely twisted arm recently diagnosed by emergency room physicians as a torn ACL. “There were so many police and police cars; they wouldn’t even let the shoppers leaving the store get in their cars.” Hampton stated. Officer Kittrell M. Carter, badge #758, serial #8702, asked Hampton, “You got your I.D.? A handcuffed Hampton informed the officer that his I.D. was in his back pocket. As the policeman reached for the wallet he asked Hampton, “Are you still in Chicago at same address? The Chairman was stunned by the officer’s pre-existing knowledge of his identity and residence before the actual identification was viewed. When asked what was going on, the group was told by an officer that they were responding to a report of a stolen cell phone, though none of the detainee’s several ringing cell phones were confiscated by police on the scene. It’s like going to the scene of a child endangerment and NOT checking on the child. After being held in handcuffs in the Target parking lot for over three hours, a separate police car arrived and each detainee, except Hampton, was ordered in front of the vehicle’s floodlight. Sergeant J. Thompson, badge #8238 then told officers to uncuff the four people and the police began to leave. When Hampton and others demanded an explanation for the fiasco as well as the names of officers and complaint forms, he was told that a robbery had occurred and a cell phone that was stolen was tracked to the Target parking lot. An unknown victim who supposedly arrived in the latest police vehicle said that none of the detainee’s were involved in alleged incident. All of this follows a recent appearance by Hampton at the City of Oakland public safety committee meeting last Tuesday, January 15th where Hampton spoke in opposition to the hiring of “supercop” William Bratton, who is known for his authorization of unconstitutional policing, the kind of which the Hampton family is painfully all too familiar. Hampton’s impassioned speech was punctuated by applause when at the end of his 2 minute open forum comment, he claimed to have received ceded time from Oscar Grant and Alan Blueford who Hampton stated, “are not able to be here to speak for themselves”. This fraudulent and random stop by local law enforcement is also only one day before the full city council meeting when Bratton’s contract is slated to be voted on by city officials. This harassment of Fred Hampton Jr. is, in essence, an attack on the work being done to stop the Bratton contract. The name recognition of Fred Hampton brings significant attention to the issue of unlawful, demeaning policing on communities of color. It is imperative that we reach out to neighbors, co-workers, comrades, and everyone who will listen to remind them that an injustice to one is an injustice to all; we must work to ensure all rights are protected. If you can, attend the City Council Meeting today, January 22nd at 6:00 pm. Come very early to get a seat, fill out speaker cards, and let Council know that intimidation tactics and apartheid-like policing will not be tolerated in Oakland! 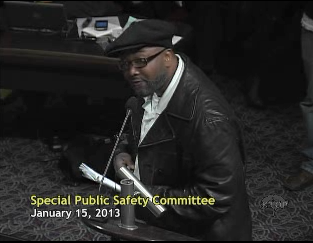 All of the speakers in the video from city hall special meeting of public safety committee on Tuesday 15 January 2013, are worth hearing. Fred Hampton Jr. speaks at 2:48:40. This entry was posted in corruption, news, opinion, police brutality, true stories and tagged bill bratton, cook the books, Corruption, fred hampton jr, nypd, opd, police misconduct, stop & frisk, william bratton on January 22, 2013 by wiseoldsnail.